I have to say I blame Marden's!!! It all started when I found this fabulous Nicey Jane laminate there and my husband mentioned that it would be really nice to have a new tablecloth. 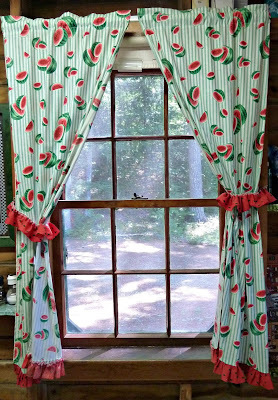 I've been meaning to replace the watermelon curtains in the kitchen since we bought our camp 14 years ago. Suddenly inspiration struck, I needed a Nicey Jane kitchen! I had perfect weather to set up shop on the porch and sew! and then tackled the larger window. These sew up really quickly! The hardest part is just measuring the windows. 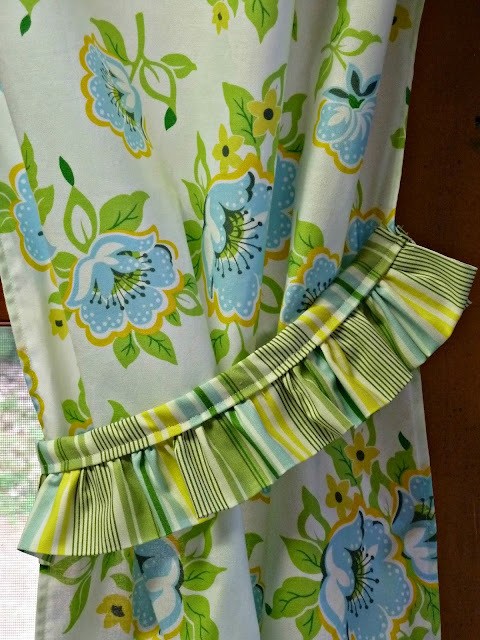 I decided to skip the ruffles off the bottoms but did make ruffled tie backs for these. While I was in decorating mode I decided what my kitchen also needed was this owl I made back in the 70s. 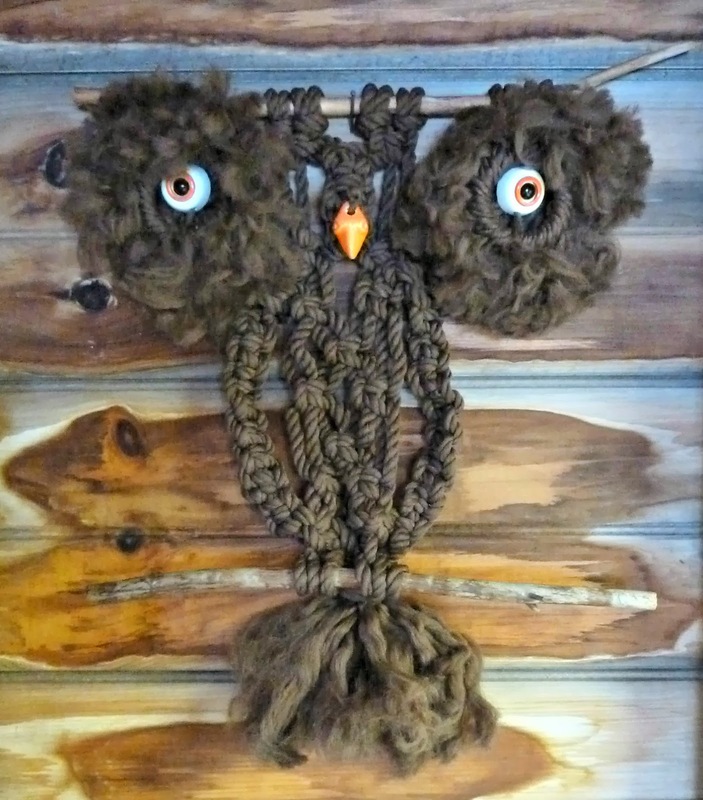 Don't judge, Jonathan Adler and Houzz have both declared that macrame is back! This looks great! You know I love Heather Bailey! Wow! 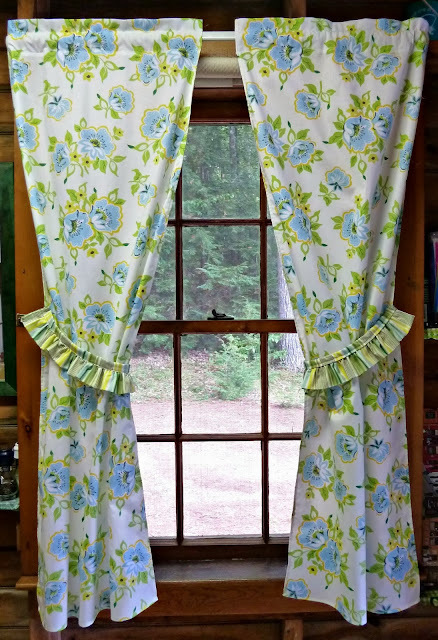 I love the curtains so much. The Nicey Jane print is just awesome. You have done such a wonderful job with the curtains and the ruffled tie backs. Nice job, your curtains look lovely., very fresh.. Cute! Mardens got me with the laminate too and I have 3 yards of two different laminates, wait, I might have 3, I can't even remember! I am not sure what to do with it all. 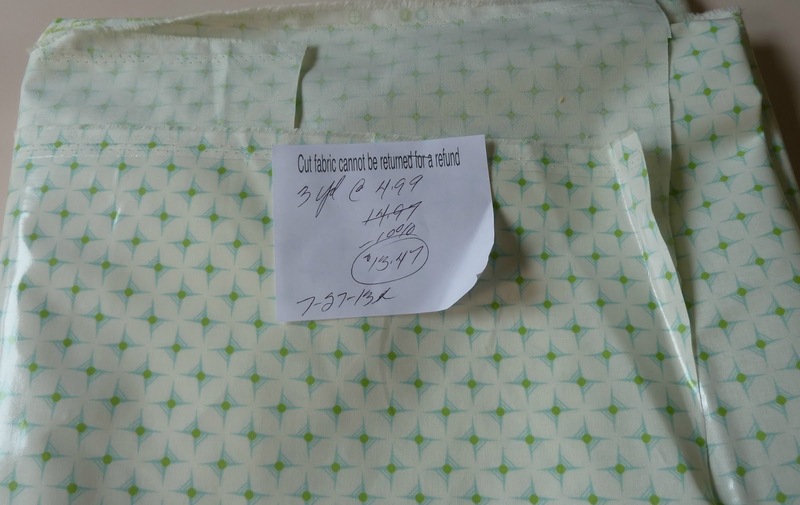 How are you going to finish the edges of the table cloth? 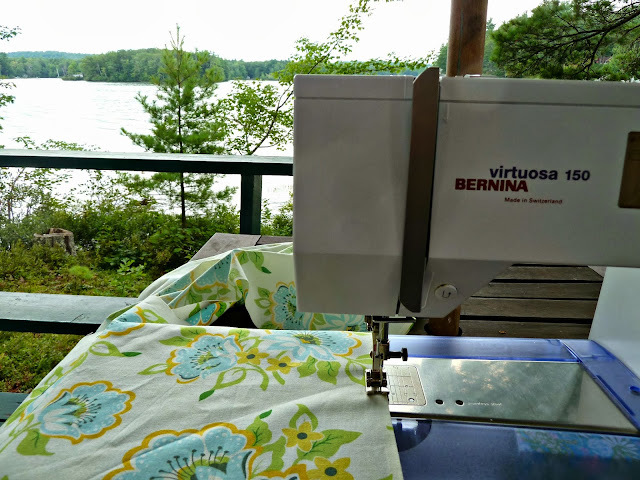 Do you have a serger? See you tues! The curtains look great...so fresh and happy! Love the ruffles! And the picture of the sewing machine on the porch...what a perfect way to sew! 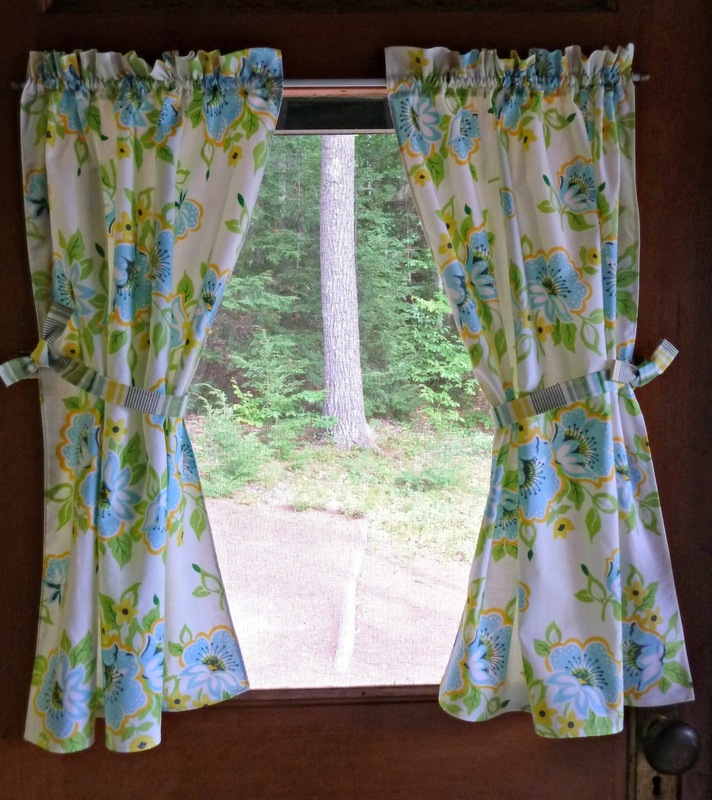 New curtains sure can change a room - and if Houzz says it's true, it is! Love the colors. 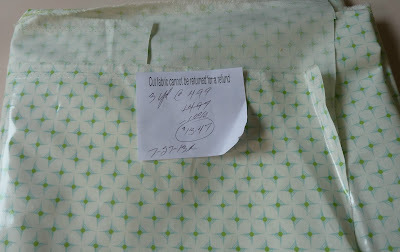 When in doubt, always blame the fabric stores. It's never our fault. Those curtains turned out great. That owl is fabulously appropriate. Marden's is SUCH a problem, isn't it?! :) Great job on the curtains, and the Nicey laminate is going to make a great tablecloth. Nice! I have not yet been to Marden's. Clearly I need to go!